With their antique collection and historical aesthetics in mind, a Las Cruces couple builds a home with mountain and canyon views. An innovative floor plan, creative siting, and a feel for synchrony set this Las Cruces home apart from the rest. Janiece Wardâ&#x20AC;&#x2122;s Upper Valley home exemplifies her love of nature, while her garden is a haven for migrating hummingbirds. An El Paso family with ties to Santa Barbara brings some California style to West Texas. 8 Life+Style Southwest Rethinking outdoor living spaces, water-friendly xeric landscaping, home renovation expert Steve Thomas talks gray water systems, mosaic tiles for kitchens and baths, and more. Stained glass artist Gail Boone shares her colorful world, ornamental iron makes a statement, and Torres Welding celebrates 30 years of business. A vegan chef shares her favorite recipes, and an award-winning garden designer uses cacti as his design centerpieces in two brand new books. 74	Vida Buena Acupuncture treatments go needle-free, Rolex watches stand the test of time, and beauty product recommendations from a local expert. Music, drama, and dance performances for the spring season. 84	Travel The best spas for a Santa Fe getaway and luxury cruising through Alaska. 92	Su Cocina Chef Johnny Vee plans a party with two doctors in their lovely kitchen, vegetarian dining options in El Paso, and ingredients and recipes to create delicious Spanish cuisine. 104	Dream On A backyard with unforgettable views of the El Paso valley. On the cover: The inviting entryway to a Las Cruces home mixes Western and Southwestern aesthetics. Read about it on page 38. Photograph by Bill Faulkner. hank you for opening up this, the second issue of Su Casa for the El Paso and Southern New Mexico communities. Our first issue was so well received, and we are delighted with all the new friends we have made in this process. The exciting news is that we’re only getting started! We are bursting with ideas to assist you in your home and life decisions. Our motto at Su Casa is, “Your home is your life. Make it beautiful.” We say this because our homes are extensions of our lives, reflecting our loves, interests, family, travels, and so much more. Our homes define who we are as individuals and who we are at our cores—themes that we eventually carry out in the designs of our homes. Thus, while Su Casa is filling you with ideas for your home, we’re also offering you exciting ideas to make your life more beautiful overall. In this issue of Su Casa magazine, you’ll learn about upcoming music concerts and great restaurants in our community, find recipes and cool kitchen gadgets, and discover why Rolex is director James Cameron’s wristwatch of choice. You’ll discover exciting new health and beauty treatments and get advice on gardening in our challenging climate. We’ll introduce you to vegetarian cuisine in our community and an El Paso physician who uses cooking as his own personal therapy. You will also see examples of exciting glass art and stunning ironwork and learn how to integrate both into your home. Su Casa is about providing inspiration to make your home, as a reflection of your life, beautiful. In this issue, you’ll tour an El Paso home that integrates design influences from Santa Barbara, California, as the owners seek to connect their El Paso life with their previous one. Traditionalists will enjoy seeing how a Las Cruces couple deliberately incorporated a historical look into their newly built home. Our homes and our lives are intricately connected, each displaying our individual personalities, tastes, and passions. It all starts with ensuring we are beautiful on the inside first, so that we can easily translate that beauty to the exposed sides of our lives, including our homes. May this issue of Su Casa provide you with inspiration, ideas, and resources to make every aspect of your life so much more beautiful. You You Can Can Teach Teach an an You You Can Can Teach Teach an an You You Can CanNew Teach Teach an an Old Old House House New Tricks! Tricks! Old Old House New Tricks! Old OldHouse House HouseNew New NewTricks! Tricks! Tricks! Copyright ÂŠ 2013 by Bella Media, LLC. El Paso Office 550 South Mesa Hills Drive, Suite D-1 El Paso, TX 79912 915-581-2300 Santa Fe Office 215 W San Francisco, Suite 300 Santa Fe, NM 87501 505-983-1444 Su Casa (ISSN 1084-4562) is published four times a year (March, June, September, and December) by Bella Media, LLC, 215 W San Francisco, Suite 300, Santa Fe, NM 87501. $9.95 for 4 issues or $15.95 for 8 issues. POSTMASTER: Please send address changes to Su Casa El Paso, PO Box 15305, North Hollywood, CA 91615-5305.
desert mirage When Mother Nature surprises the Southwest with unexpected blasts of cold weather, many homeowners brace themselves to see if their palms and cacti survived the freeze. The owners of this El Paso backyard, however, remain carefreeâ&#x20AC;&#x201D;secure in the knowledge that weathering only enhances the look of their 21-foot, galvanized steel palm tree. Created by Desert Steel artists Eric Carroll and Richard Turner, this sculpture beautifully complements the colors and textures of the locale, setting the tone for an enchanting desert oasis. Well-appointed both inside and out, this lovely estate features cantera stone, high-end appliances, and an infinity edge pool. The views go on for miles from this magnificent Ocotillo Estates home in West El Paso. A sumptuous outdoor living area maximizes enjoyment of the surrounding landscape. DON’T SELL YOUR HOME... REINVENT IT! A beach entry (above, top) leads the way into an outdoor oasis designed by Gino Farina of Blooming Paradise. Farina makes the most of space by incorporating visually interesting architectural elements right into the pool (above). A cozy fireplace nook (left) maximizes the spectacular views. erty character.” This design outlook also allows you to break away from the idea that your space should be designed with one primary purpose in mind. Just because you entertain frequently doesn’t mean you can’t also incorporate some cozy nooks for private relaxing. Of course you’ll want a large gathering space for bigger groups, but also scatter around smaller, more intimate seating areas for a change of scenery. Pools and spas create major focal points, so going bare and basic simply doesn’t make sense. Don’t limit yourself to geometric designs if gentle curves would better match the flow of the land. Neither your pool nor its attached spa have to necessarily be at ground level. Play with elevations to take advantage of views and create architectural interest. And don’t be afraid to get a little creative by incorporating beach entries, decorative tile and stone, fire elements, and water features. The same carefree attitude should also apply when choosing the surrounding foliage. Manicured beds of carefully tended flowers are out. Opt instead for verdant vegetation that crawls and creeps and grows of its own accord (think English garden). The more overgrown, the better. If you think that’s not possible in the arid Southwest climate, you aren’t talking to the right experts. There are plenty of vibrant floras, including some exciting cacti and xeriscape options, that flourish in the desert. (See “Desert Beauty,” page 18.) A skilled landscape designer can install built-in irrigation systems that will keep your plants healthy with minimal effort on your part, leaving you free to spend time in your backyard for the right reason: complete and utter enjoyment of your personal oasis. ush green lawns may be standard in the American Midwest where rainfall is plentiful, but here in the Southwest, local landscaping experts agree that some of the best yards are created entirely with native vegetation that requires minimal water. It’s called xeric (pronounced “zeeric”) landscaping, and the main goal is water conservation. Note that the correct term is xeriscaping, not “zeroscaping,” says Sherri Taylor, assistant landscape designer at 150 Sunset. “Xeriscape doesn’t mean no-water use; it just means low-water use.” “Xeriscaping is almost the norm today in the Southwest,” says Mark Nash, owner of Nash Patio & Garden in El Paso. “It used to be probably 80 percent traditional and 20 percent xeriscape. Now it’s the opposite.” This surge in popularity relates not just to drastically reduced watering needs, but also to ease of maintenance. Xeric plants generally don’t require pruning or fertilization and can even benefit from the natural soil. Mark Nash played with light and shapes in this El Paso home’s xeric landscape. In addition to plenty of green foliage, he also added pops of red, yellow, and purple color (opposite). Vary water flow. Drip or bubble irrigation systems with multiple valves allow control over the amount of water released to meet the varying needs of different plants. Choose cacti with care. Species that thrive in Phoenix may not work at the slightly higher altitude in this region. Mark Nash says when in doubt about cacti surviving a particularly cold night, just throw a burlap sack over them. And don’t plant cacti in proximity to other xeric plants; they prefer to get their moisture from the air, not via roots.“Cacti will rot when too close to the drip irrigation system,” he says. Su Casa magazine Online Resource Guide A free, comprehensive guide for consumers who want to tap into design, architecture, and building communities. April showers bring power outages El Paso Electric’s tips for weathering the storm Power outages are more common in the spring and summer months, thanks to stormy weather and increased air conditioning use. El Paso Electric (EPE) puts its more than 100 years of experience providing electrical service to West Texas and Southern New Mexico toward minimizing outages as much as possible, but when outages do occur, EPE offers these tips: •	Prepare an outage kit that includes flashlights, a battery-powered or windup alarm clock, a battery-powered radio, extra batteries, a manual can opener, and a first aid kit. •	Know the location of your home’s fuse box or circuit box. •	Cordless phones don’t work if the power is out. Have a standard phone or cell phone as a backup. •	Automatic garage door openers also don’t work without electricity. Check the instruction booklet—ahead of time— about overriding manually. •	Avoid opening refrigerator and freezer doors. A full, unopened freezer should keep food frozen up to 48 hours. Food should stay cold in an unopened refrigerator for 24 hours. •	Disconnect appliances that turn on automatically when power is restored or that may become damaged due to voltage irregularities (computers, VCRs, televisions, stereos, answering machines, etc.). Tap into energy savings at elpasoelectric.com and click on the sunny side logo. Are your trees trying to tell you something? Over- or underwatering, too much fertilizer, and insect infestations all show distinctive signs through a treeâ&#x20AC;&#x2122;s leaves. Learn to read the signs to keep your trees healthy and green. infestation of borers (small insects that bore holes in trees). What to do: Up the water usage and check for borers. Purchase borer control from a nursery. Problem: Tree leaf totally brown Possible causes: Late frost, normal aging, or root rot. What to do: Not much can be done if the cause is frost or aging. If the leaves are turning brown only at the bottom, this is the normal aging process. “Standardized, manufactured gray water systems should become as routine to install as water heaters.” —Steve Thomas more than 40 percent. Add to that additional rain catchment and xeric planting, and a home could potentially see a negative use scenario. Now imagine if we all did this! My thinking is that standardized, manufactured gray water systems should become as routine to install as water heaters. They should perform reliably, be reasonably priced, and allow us as homeowners to do our part in preserving the resources that make the Southwest such a wonderful place to live. Consider installing a gray water system in your new home or retrofitting your current home with one; it’s the right thing to do. And I promise, a heck of a lot easier than carrying water a quarter mile from the local cistern. What is a gray water system? Gray water is the water produced when you use your bathroom sinks, showers, tubs, and laundry. The water from these sources is considered to be suitable—that is, clean enough—to irrigate certain home gardens and landscapes. This reuse of your household water is an excellent conservation method, especially here in the arid Southwest. A gray water system is a method of plumbing a home whereby this usable gray water is routed to a holding container and then used for irrigation of most non-food plants. It must be strictly marked as nonpotable. Depending upon what state you live in, there is usually a limit to how much gray water your system may produce each day without a permit. In New Mexico, 250 gallons is the daily limit; in Texas it’s 400 gallons. What water cannot be used in a gray water system? The water from dishwaters and kitchen sinks, because it may contain food particles or organic matter, is not usable in a gray water system. Likewise, water from toilets—referred to as blackwater—cannot be reused around your home in any way. Interceramic’s Pietra Cristal line spruces up a shower. Mirroring the modern look of bamboo is Daltile’s ultra-thin Caprice tile. Copper blend mosaics from Daltile (below) add a gleam to suede background tiles. From over-the-top elegance to subtle decorative detailing, mosaic tiles are perfect for homeowners who know what they like and arenâ&#x20AC;&#x2122;t afraid to show it. By definition, mosaic involves combining small pieces of glass or stone to create a bigger picture. In terms of tile, however, it’s not necessary to create an actual image. With an exciting variety of colors, shades, and shapes, these smaller tiles stand on their own, creating vibrant focal points that truly reflect personal tastes. Inside, mosaics work well on kitchen and bar backsplashes, fireplace surrounds, and shower walls. Outdoors, consider incorporating them into pool, spa, and water fountain designs. The alternating tones in Emser’s Lucente Blend mimic a natural stone backsplash in a kitchen. Applying thousands of tiny and colorful Interceramic Pietra Cristal tiles on a large wall (left) creates visual interest. Gail Boone has found a way to encourage others to embrace the craft that changed her own life several years ago. In her home workshop (opposite), Boone often draws from her love of nature and the outdoors when designing her glass projects. A desk lamp with delicate leaves (above) is one of the artist’s favorite creations. The foyer in Boone’s personal home is a testament to her art. her mother tried it out—and fell in love. “She went back to New Orleans and took some classes there. Now she’s 80-something years old, and she’s still doing it!” Boone says. Stained glass is now something of a family craft: Boone’s most recent student is her nine-year-old granddaughter. In teaching others, Boone has found a way to pass on a tradition and to encourage others to embrace the craft that changed her own life several decades ago. wood. “We often match exterior elements with the same iron designs inside to give a cohesive look to the entire home,” says Saenz. Ironwork is practically mandatory for authentic oldworld European homes, but it also beautifully complements a number of other design styles. The rustic feel is perfect for Craftsman, cottage, and adobe-style homes, and sleek metal accents fit nicely into modern styles as well. “A lot of people like the ornate curves and scrolls, but we also match contemporary styles, usually with straighter lines and simpler designs,” says Torres. Torres Welding (above and far left) and Elite Design (left) prove that security measures can also be elegant with ornamental window grilles and entrada doors constructed of solid iron. Torres Welding celebrates 30 years of iron craftsmanship Sam Torres has always enjoyed working with his hands, so a career in the automotive industry initially seemed right up his alley. He soon realized, however, that tinkering with cars left his creative desires somewhat unfulfilled. Armed with basic welding training from his time in the National Guard, he set out to hone his metalworking skills. After several years of working metal for other people, he felt confident in his craft. With his bookkeeper wife, Cindy, by his side and prepared to handle office duties, they opened Torres Welding in 1983. What started out as a simple two-person outfit in a 30 x 30' prefab building behind their home has since grown into one of the most respected businesses in the Mesilla Valley construction industry. Theyâ&#x20AC;&#x2122;ve gradually added on over the past three decades, and Sam and Cindy now operate an 8,500-square-foot workshop with more than 10 full-time employees on staff. Part of the company’s workload includes erecting metal buildings and providing metal framework for other construction projects, but they are perhaps best known for their custom ornamental ironwork. With a huge binder of photographs, Cindy helps clients design fences, gates, doors, staircases, and other decorative iron elements. “Nothing we do is mass-produced,” she says. “Everything is custom-madeto-order. I generally have clients look through the album first and pick elements they like. Then we help them design pieces completely unique to their tastes and personalities.” The clients’ visions are then crafted by hand in Torres Welding’s impressively clean and well-organized workshop. (Sam insists on a tidy shop, and the workers break an hour early on Fridays to put it in immaculate order before the weekend.) “We are all about teamwork here,” notes Cindy. “No job is done by just one person. Everybody has their hand in every project.” With astute skill and attention to detail, the metalworkers bend, press, cut, grind, weld, and paint to bring to life one-of-a-kind works of artisan craftsmanship that are now gracing homes and buildings all over the Southern New Mexico and El Paso region. After seeing firsthand just what the Torres Welding team can accomplish, it’s no surprise that their 30-year reputation is stronger than ever. Some might even say it’s solid as iron. n a society obsessed with youthful appearance, it’s refreshing to come across individuals who recognize a certain beauty and refinement that can only come with age. When Wayne and Elizabeth Grinnell began planning their dream home, they envisioned a re-creation of the welcoming warmth of times gone by. Sitting at a rustic table in their kitchen, the Grinnells pull out a well-worn copy of Western Ranch Houses by Cliff May, the book that inspired the layout design of their home. “This house started out as a concept of Western ranch houses that were created back in the 17th and 18th centuries by the Spaniards and Mexicans,” explains Wayne as he thumbs through the dog-eared pages. “We did the design for this home working with circles on butcher paper. There were no plans. Expansive portales on all sides of the home allow for optimum enjoyment of the canyon views. After taking a course at NMSU, Wayne Grinnell built a working windmill on the property (opposite). A farmhouse sink, wood countertops, and an island built from a repurposed carpenter’s bench give the kitchen historical authenticity and charm. The comfortable master suite is a place for relaxation (for pets, too), with a luxurious walk-in shower (below, right) just steps away. In lieu of a traditional office, the Grinnells opted for a handsome library to house their treasured collection of books. Ample natural lighting plus comfortable his-and-hers reading chairs encourage lounging with a cup of coffee and a good book. Large skylights in the master bath create ambience and highlight the architectural details. A clawfoot tub echoes the vintage style of the home. Nestling the home in a secluded desert canyon (left) affords the homeowners extra privacy and jaw-dropping sunset views of the valley (below left). Each space in the home has a unique feel, as if it were put together like a patchwork quilt instead of all at once. An inviting inglenook is Elizabeth’s favorite room in the house. “It’s an away place,” she says. Like a true Western ranch house, cast iron pots hang in the Grinnells’ open pantry. Stone and water features add to the peaceful mood of the home. Lorana Leonard of Hacienda Carpet & Tile added an inlay design to the foyer (right, top) that matches the kitchen countertops. Picture windows in the breakfast nook (above) capture the views to the back of the home. The living room (left) doubles as a music room. building of their home. “We love people,” says Maxine. “We don’t have a foreman, and we only take on two to four projects per year because we enjoy being on the job site daily, interacting with our clients. It allows us to remain in close contact with them and has also allowed us to maintain close friendships with the great majority of our buyers.” It soon became apparent that this was a match made in heaven. The hopeful homeowner had strong ideas about what he wanted as well as an astute design eye, but he needed a guiding hand in putting it all together. And as it turns out, this is where Copper Canyon Homes excels. “Sure, we have our own personal tastes, but we are very comfortable working in a number of different design styles,” says Maxine. “We prefer not to be Bright forest green marble tiles for the kitchen countertops (below) coordinate with accents throughout the home. Cabinetry, tile, and décor match seamlessly in the kitchen (left). Aquarium designer Bill Hughes created a two-sided aquarium that can be enjoyed from the formal dining room (above) as well as the entryway. Handsome cherry cabinets conceal the mechanical equipment and supplies. pigeonholed. We don’t want someone to see a house and immediately know we designed it, but we do want them to immediately see the personality of the homeowner.” In this case, the homeowner had a strong personality, and he came prepared with a solid and specific wish list. Fortunately, the Webbers enjoy a challenge—(“All those details that stress people out and drive them crazy? Maxine actually thinks they’re fun,” quips William)—because meeting the homeowner’s first request took a bit of inventive thinking. Certain he wanted the main living areas on a large open floor plan, the homeowner was just as adamant that each space be defined and individual. Extrawide archways with cherry wood columns framing the den, living room, and formal dining room go a long way in achieving this wish. The flooring tailored to each space—glazed tiles in the foyer and kitchen, carpet in the den, and gleaming cherry wood in the formal areas—finalizes it. “A lot of people are afraid of juxtaposing wood against tile, but it can make for a good transition with a little creative thinking,” notes Maxine. The spacious kitchen, centered to take advantage of both the front views through the den and the rear views of a tropical oasis backyard through the breakfast nook, serves effortlessly as the heart of the home. As the homeowner says, “Everything just flows around it.” Harmonious flow, inside and out, was actually on the homeowner’s priority list, and once again, the philosophy at Copper Canyon Homes was a perfect fit. “We like using wood and stone, a lot of natural materials,” says Maxine, “and we connect the inside with the outside by doing whatever we do in one, in the other.” The checkerboard patterned wood columns defining the living spaces also soften the vast concrete of the outdoor basketball court. The cultured stone fireplace surround mirrors the home’s exteriors. And the massive picture windows (facing forward, of course) frame the million-dollar view of the mountains, giving the enchanting desert surroundings a starring role in the interior. Our extensive knowledge & impeccable workmanship makes us the leading choice for contractors & home owners. Incorporating architectural details like hand-carved wood columns and ceiling treatments is Maxine Webber’s specialty. Window coverings from Myers Draperies & Blinds in Las Cruces can be lowered from top to bottom to block the sun no matter the time of day without distracting from the views. The result is a personal opus written by the homeowner himself. “I’m not afraid to take chances,” he says. “I didn’t want the home to be predictable.” The Webbers had done their part by incorporating unexpected architectural details in each and every space: carved beams and coffers, concentric arches, big ceiling treatments, straight lines played against undulating curves. The homeowner took his cues from these elements and his love of color to bring together a design scheme worthy of a professional interior decorator. Like the home itself, the interior design came together with ease, with the perfect pieces seeming to find him. “I took my time, picking things up as I came across them,” he explains. “And I just knew when I saw each piece where it would fit. Nothing is exactly the same, but there are repeating patterns and tones, cohesion, and harmony.” There is only one word to describe a partnership coming together so flawlessly that it created a home that flows effortlessly from all angles. It could only be destiny. The cherry wood and green accent themes flow through the home all the way to the master bathroom which features a soaking tub and a glass-enclosed shower. A stately wrought-iron curved staircase leading from the master bedroom (opposite, top) opens to a private balcony. In the colorful Mexican-style kitchen (above, top), retablos are painted into the cabinets, while the hand-painted Moroccan ceiling feature in the living room (above) complements the room’s red accents. El Paso artist Rudy Montoya is best known for his poignant Native American portraits, as seen in Ward’s dining room. The sunroom (right) is an old Mexico mélange of fountains, greenery, and ornamental ironwork. Throughout the season, several different hummingbird species visit Ward’s feeders. In 2010, she was delighted to spot the extremely rare Anna’s X Allen hybrid. Sunday afternoons are often spent with family and friends watching football games or videos on the sumptuous leather recliners in the media room. A revitalized wine room (opposite) houses the owners’ impressive collection of vintages. Steele and the homeowners embarked on a pilgrimage to the California coastal city of Santa Barbara, immersing themselves in the architectural character firsthand. In the kitchen, a large island, bar seating, and an adjacent living room create the perfect gathering spot for family and friends. High-end appliances and plenty of counter space make serving everyone a breeze. The patio in the back of the house has two fireplaces and a full outdoor kitchen. Wrought iron patio furniture with bright red cushions continues the home’s Spanishinspired color scheme. Inside, the entire structure was gutted in favor of a layout more congruent with the Spanish lifestyle, which centers heavily on family life and entertaining. into the formal living and dining spaces. “Really the only sense of style in the original home was the three bricked arches in the main living area,” says Steele. “They were unsightly and not in line with the Santa Barbara style we wanted, so they were the first to go.” The large, and now open, space is graced with high ceilings and three sets of arched windows and doors. A floorto-ceiling fireplace serving as an informal room divider was left intact, but the unimpressive brick surround was replaced with an elegant white stucco treatment that better complemented the Spanish Colonial styling. “Originally, we planned on a big wood treatment in this area, like heavy ceiling beams. But after we finished up the other details, we decided it didn’t need it. The space is so pretty as it is. It stands on its own,” says Steele. In most Spanish-style homes, the kitchen is the epicenter, the heart and soul of the home where everyone gathers to eat, cook, and converse. “Everybody’s always in the kitchen,” Steele notes. “No matter what’s going on in the home, people always seem to be stopping by the kitchen.” She took this concept—along with her personal experience as an avid cook—to heart in creating a kitchen that is both a utilitarian space to prepare meals, as well as a communal area to bond and interact with family and friends. An outsized, marble-topped island is surrounded with professional-grade Viking appliances. Solidifying the design style the homeowners desired, a bespoke mosaic mural over the stove depicts the home in the rolling hills of Spain. While redesigning the floor plan, Steele also incorporated all the space and amenities the homeowners desired. “We added several new rooms, including a home gym, a media room, and an extra guest bathroom,” she says. “A number of other rooms in the home were expanded.” In addition to two full bars (one in A grand fireplace in the Santa Barbara style (one of five in the home) is an elegant focal point in the cozy living room. the media room and another just off the kitchen), the homeowners also requested space to store their impressive wine collection. “The original home included a wine room, but it was uninspiring,” says Steele, who renovated the space to incorporate a barreled brick bóveda ceiling, gleaming dark wood racks, and corbels for displaying special bottles. With added touches like a crystal chandelier and artwork, the homeowners readily admit that the wine cellar is one of their favorite elements in the home. Just stepping onto the back porch transports these happy homeowners to their beloved Santa Barbara. With El Paso’s moderate weather, they often find themselves taking a bottle from the wine room and enjoying it alfresco. When a few other red-tiled roofs dot the hillsides below and at the right time of the day, it almost seems like the Pacific Ocean is glittering at the edge of the expansive valley. In the master bedroom, sleek wood and rich textiles bring added warmth to the space. European System Construction Method Kitchens, Bathrooms, Entertainment Centers Full Selection of Woods and Finishes Professional Installation by Skilled Staff Warranty on Materials and Workmanship Proudly Made in El Paso! Despite the dark accents, the master bathroom is completely feminine and elegant with its marble-topped vanity and dressing area and chandelier over the clawfoot bathtub. Self-taught chef Mérida Anderson found her calling at the ripe age of 16 when she decided to eat vegan. “My Author and Chef Mérida Anderson mom didn’t want to cook for me,” she remembers. “One night soon after declaring my decision to be vegan, I sat down at the kitchen table and she piled some old vegetarian cookbooks in front of me and said, ‘We’re having chicken. What are you having?’” Anderson’s own vegan experience sparked the innovative cooking style she is known for at VSS (Vegan Secret Supper), the hip dining club she operates in Brooklyn. Dinner or supper clubs stray from the typical restaurant setup in favor of a more social experience, often in private homes. Anderson’s interests were aroused on a bike tour through Halifax, Nova Scotia where she attended a vegan supper club event hosted by a friend. After bringing the concept back to Vancouver and eventually to Montreal (she still does pop-up events in both), Anderson moved to Brooklyn where she now hosts her popular multicourse, animal-free suppers in her own home. Communal seating creates a relaxed atmosphere that often transforms strangers into friends during the two-hour dinner service. Anderson’s first cookbook, Vegan Secret Supper: Bold & Elegant Menus from a Rogue Kitchen, features over 100 recipes for plant-based meals. The dishes are jam-packed with flavorful, fresh, and unexpected ingredients, showcased in beautiful color photographs that make them even more tantalizing. Recipes include appetizers like Apple-Smoked Tofu and Caramelized Onion Spring Rolls and main courses like Pipián Pesto Tortellini with Seared Asparagus and Roasted Tomatillo Sauce, or Blue Corn Empanadas with Pecans, Black Beans, and Mole. Anderson’s delectable (and dairy-free) desserts include Dark Chocolate Cake with Chocolate Ganache Glaze and Avocado Mint Ice Cream. Vegan-friendly recipes aside, this cookbook takes food prep a step further, offering sound advice on plating, pantry stocking, flavor pairing, and menu planning. Anderson inspires readers to get in the kitchen, start cooking, and maybe even host an entire vegan supper. Blue Corn Empanadas with Pecans, Black Beans, and Mole. Eating vegan doesn’t have to include giving up your favorite Mexican dishes. When it comes to garden plants, cacti are anything but standard issue,” says Scott Calhoun, an award-winning author and garden designer based in Tucson, Arizona. “They are the plant family of the future—especially in arid parts of the world.” In the early stages of his career, Calhoun remembers using cacti solely as accent plants, but says they have since become the centerpieces of his designs. “[Cacti] form the prickly heart of some of the most interesting gardens in the world,” he says. “Designs peppered with cactus have become my new design paradigm. To boot, these designs are of the very most water-thrifty and undemanding sort.” As Calhoun’s interest grew in what he calls “the sharp side of gardening,” he was inspired by a lack of published information on the subject to write his own book. The Gardener’s Guide to Cactus: The 100 Best Paddles, Barrels, Columns, and Globes, highlights 100 North American species of cacti, each illustrated with lavish color photographs. Calhoun covers the gamut of the prickly trade, from planting techniques and care to advice on how to best display and arrange cacti. As an added bonus, he includes suggested companion plants and even discusses culinary uses where appropriate. This book is designed to get the average cactus gardener past any and all preconceived notions they may have about the cactus family. “It is possible that my enthusiasm for these endlessly fascinating plants will be contagious as you browse this book,” says Calhoun. “I aim to get you hooked—hopefully not literally.” Indeed, readers may be pleasantly surprised to discover that cacti are much more than boring and uninteresting desert plants. They effortlessly imbue texture, color, shape, and even scent on any plot. Who says beautiful gardens don’t grow in the desert? Dr. Cynthia Carey is a true believer in the powers of alternative medicine. She first became interested in chiropractic and holistic health when conventional medical practices, including some very strong painkillers, failed to alleviate her chronic migraines. Carey became so enamored with the successes she found in alternative medical options, she switched careers and entered chiropractic medical school at the age of 55. Carey has never once regretted the decision, and she now operates Truecare Chiropractic and Acupuncture in El Paso with her business partner and med school classmate, Dr. Kris Hristov. She is trained in many alternative medical treatments, but admits a passion for acupuncture. “I love discussing acupuncture and educating people about this marvelous, energetic technique for improving a vast variety of conditions and symptoms,” she says. This ancient Chinese medical practice was almost unheard of in America until the early 1970s when a New York Times journalist, James Reston, wrote an article about the remarkable pain treatment he received in Beijing following an emergency appendectomy. Despite Reston’s raves, Americans were naturally a bit apprehensive about being stuck with bunches of needles, a practice seemingly counterproductive to pain relief. Laser colors and strengths vary depending on condition, but the procedure is completely painless and free of side effects—except of course for the positive ones. Dr. Cynthia Carey performs a painless laser acupuncture treatment on a patient at Truecare in El Paso. “The premise of Truecare is quite simple: focus on and delight our patients with personalized care in a beautiful and energetically healing setting,” says Dr. Carey. fields. Fortunately, industry knowledge continues to grow and take advantage of modern innovations. For curious but needle-shy patients, laser acupuncture may be just the relief they’ve been seeking. an abundance of wood throughout the home give it a rich, warm, inviting feeling of welcome. Ward says that the children’s book The Salamander Room by Anne Mazer is the perfect illustration of how she likes to envision her home. In the book, a little boy invites all sorts of plants, animals, and outdoor elements into his room in order to make his pet salamander feel at home, until it is really no longer his room, but an outdoor space with his bed in its midst. For Janiece Ward, that would truly be paradise. One part sugar (white cane sugar only) Four parts water Change the water every 2–3 days during hot weather. Do not use honey, brown sugar, molasses, artificial substitutes, or red food coloring. n 1960, the deep-sea submersible Trieste made its legendary dive to the deepest place in the ocean: the bottom of the Mariana Trench. But the Trieste wasn’t the only object to make history that day. Strapped to the bathyscaphe’s hull was a specially crafted timepiece made by renowned watchmaker Rolex. When the Trieste ascended to the surface, the Rolex Deepsea Special was still ticking away, having withstood immense pressures at 35,814 feet below sea level without losing a second. Since the company’s founding over a century ago, Rolex’s watches have accompanied adventurers on expeditions to all parts of the globe. Chuck Yeager was wearing a Rolex Oyster when he broke the sound barrier in 1947. Rolexes have been worn on the International Space Station, on a flight to the moon, and to the top of Mount Everest. While today’s Rolex buyer may not plan on scaling mountains anytime soon, many people are still drawn to the brand for its storied past—and its continuing commitment to precision and quality. “Brand names in watches mean a lot,” says Susan Eisen, a watch appraiser and repair specialist in El Paso and owner of Susan Eisen Fine Jewelry and Watches. “It’s like how what you drive tells a lot about you; a watch tells a lot about you, too.” According to Armando Medrano, owner of El Paso’s Jewel Gallery, the Rolex brand evokes “heritage, expertise, and luxury.” Those key terms have been associated with the company since its inception. Rolex founder Hans Wilsdorf was a champion of innovation from the start. At the turn of the 20th century, wristwatches had not yet gained widespread popularity. Many dismissed them as too unreliable, too difficult to maintain, or too easily damaged. Wilsdorf set out to change that. In 1910, his brand new company obtained the first-ever Official Swiss Chronometer certificate granted to a watchmaker; previously, the award had only been granted to official marine instruments. Fabulous Homes and Seasonal Flair In our Summer issue, we highlight an El Paso townhome’s luxurious makeover, a hillside bachelor pad’s spectacular views, and the area’s New Urbanism movement. We also explore Texas Hill Country’s many wineries, and share tips about seasonal planting, local food markets, and more. lthough owned and operated by a certified nurse practitioner, CA Skin and Body in Las Cruces offers an experience more akin to a spa day at a friend’s home than a visit to a medical clinic. Anna Marie Hooley and her team take a refreshing, modern, and effective approach to beauty. In addition to providing skincare treatments and products, they offer advice on other factors that affect aging and beauty such as diet, medications, and exercise. “What we try to do here is make living healthy a habit,” says Anna. “We believe that beauty comes from the inside, and we’ve had better results that way.” Here Anna shares her picks for some of the best beauty products and treatments on the market. a beauty blog worth reading Truth In Aging Having grown tired of wasting money on beauty and anti-aging products she never used, Marta Wohrle founded Truth In Aging, a website and blog dedicated to providing honest and unbiased reviews of beauty and personal care treatments. “Like many other people I had a bathroom full of half-filled jars of things that had promised a lot and delivered little,” Wohrle says. “I decided to get informed and try to be a savvier consumer. Most of the information was so bad that I ended up doing my own research to teach myself about which antiaging ingredients worked, which did not, and why. Truth In Aging is a forum to share as I learn.” Recognizing that the signs of aging go well beyond fine lines and wrinkles, this site also covers everything from thinning hair and superfoods to exercises to keep the body in tip-top shape. “Feeling and looking fantastic as we get older is about taking care of the whole package,” the site proclaims. As a former journalist and media consultant, Wohrle knows how to make a website that people continually return to. Truth In Aging is easy to navigate and isn’t overly cluttered with advertisements. Visitors can select their age on the homepage in order to receive content appropriate to the aging issues they are most likely facing. The site is updated daily with fresh articles and reviews from a team of more than 20 guest contributors providing their unique viewpoints and opinions. Since Truth In Aging does not accept any form of payment for their reviews, readers can expect candid write-ups from consumers that are quick to point out products that don’t live up to their hype. The warming room at the Four Seasons Resort Rancho Encantado Santa Fe is encased by glass walls overlooking a meditation garden. At the Inn and Spa at Loretto (above), regional treatments are the specialty. Ten Thousand Waves combines Japanese-style soaking tubs with Eastern-inspired bodywork. Nidah is a Native American word for your life; you will certainly find yours enhanced during your visit. At Ojo Caliente Mineral Springs Resort & Spa, accommodations range from camp sites to private homes and cliffside suites. Ojo Caliente’s sulphur-free, geothermal mineral waters have been revitalizing visitors for thousands of years. Luxurious lounges (above), elegant staterooms (left), and fine dining (below, right) await aboard Holland America Line cruise ships. On your trip to Alaska, expect to see an abundance of wildlife. A Dahl sheep (below, left) peeks from behind a mountain crag. Seward, Anchorage, and the Kenai Peninsula. Both options provide plenty to see and do, so the choice is often logistic in nature, notes Elvejord: “If you’re traveling as a family, round-trip might be the better option to ease air costs.” In addition to the traditional cruise option, most Alaskan cruise lines also offer what is called a cruisetour, where travelers spend a portion of the vacation at sea while the other half is dedicated to land travel. For those looking forward to all the comforts and conveniences cruising offers, there’s no shame in forgoing the land portion in favor of extra time for relaxing and enjoying the shipboard amenities and views. But if you want to experience the vast and stunning interiors the state offers, opting for a cruisetour won’t disappoint. “The beauty of a cruisetour lies not just in the scenery of the state’s interior, but in the increase in wildlife viewed, and the enhanced exposure to Alaskan culture,” says Coleman. Alaskan cruisetours are certainly for adventurous spirits. Optional excursions include helicopter flightseeing, glacier hiking, dog sledding, and fly fishing. You can even venture far north into the immense wilderness of the Yukon. Many cruisetours also incorporate rail travel, offering a unique perspective on the country. “While riding the train, you get a sense of what it might have been like to be one of the first settlers to arrive in the territory,” says Coleman, “although these trains are domed in glass with all the creature comforts.” The real gem of land travel in Alaska, however, is the captivating Denali National Park: six million acres of wild land and home of Mount McKinley. “The mountain and the wildlife are spectacular,” says Elvejord. “Two years ago, I took a wildlife tour in the park, and my group saw grizzlies, Dahl sheep, caribou, fox, porcupine, and hawks. And seeing the mountaintop was an added bonus.” Admittedly, it’s hard to go wrong in Alaska, especially with luxury cruise lines that know a thing or two about vacationing in comfort and style. Rest assured, no matter which itinerary or embarkation point you choose, unbelievable views and opportunities to get up close and personal with nature are abundant on both land and sea. Alaskan cruisetours are certainly for adventurous spirits. Optional excursions include helicopter flightseeing, glacier hiking, dog sledding, and fly fishing. e is a physician who oversees two emergency rooms; she is a dermatologist who also works full-time. Toss three children into the mix, and these two doctors—Randy Goldstein and his wife, Karen Herman—will tell you that down time is an important part of achieving a balance, while having energy left for some fun is crucial. For this El Paso couple, finding a house with an ideal kitchen for entertaining was tantamount to their other required features—kid, pet, and office space. Their charming home in the Upper Valley Country Club district of the Sun City exemplifies the type of living space that covers all the bases—and for Dr. Goldstein, a well-furnished kitchen is as important as a well-equipped ER. Despite Goldstein’s dual role as ER medical director at both Las Palmas Medical Center and the El Paso Children’s Hospital, he and Herman, who is in private practice, lead a full social life. The family moved to El Paso from Virginia in 1999, where their first house in the mountains had a little kitchen with a glass top stove. In choosing their new home, Goldstein wanted a kitchen they—and especially he—could love. They looked at about 20 homes before settling on one and were initially not thrilled that it included a pool. “With the kids being small and us both being so busy it just seemed like a lot of extra work—but we both loved the kitchen immediately,” Goldstein says. Actually, there was a lot to love about the home. “We really wanted wood burning fireplaces and were lured by the fact that there are four in the house—including one in the kitchen,” says Goldstein. “There are patios everywhere; I have an herb garden off my office and lots of windows and light. There are great views of the pool from the bedrooms and a big hot tub off the master suite. The layout of the house works well because the kids (Elan, 12; Dora, 10; and Leor, 7) have their own wing.” But it is with the kitchen that Goldstein waxes lyrical. “An eat-in kitchen was essential—our table can seat ten,” he says. “There was a lot to work with. We extended the pantry by transforming a hallway into storage and adding a pot rack and bookshelves. [Karen loves to collect cookbooks.] A closet was replaced with a tall Viking wine fridge, and then we added shelving for wine glasses. A small side sink with instant-hot water and a Sub-Zero ice machine underneath acts as a mini-bar/butler station. Randy and Chef Johnny prep for dinner indoors and ready the outdoor kitchen, which includes a Cal Flame gas grill and one of Randy’s favorite gadgets: a Masterbuilt digital electric smoker. Karen Herman grabs a bottle of wine from the Viking wine chiller in the butler’s pantry. There is also ample space for pots, pans, and Karen’s beloved collection of cookbooks. Party on! Randy and Karen’s Bicoastal El Paso Summer Celebration made delicious use of the smoked salmon (recipe opposite), capers, and watercress. No summer party would be complete without a little vino. While Randy played chef, Karen focused on the party planning and tablescaping. She decorated the tables set poolside with festive nautical effects: starfish, fish netting, sand, and life preservers. Candles and twinkle lights transported us to the coast—as did the menu. The night went off without a hitch—I was impressed how relaxed and calm the host and hostess were despite the large number of guests. The smoker and grill were both incorporated into the cooking process. Bruschetta for a tomato-basil salsa spent some time on the Cal Flame, while sides of salmon were brined and sent to the smoker. Inside, southern crab cakes sizzled on the stove’s griddle, and green chile mussel stew bubbled in one of Goldstein’s big Le Creuset pots. Thanks to guava cake with tres leches ice cream, a dreamy night spent poolside finished perfectly—and deliciously. John Vollertsen, aka Chef Johnny Vee, is the director of the Las Cosas Cooking School in Santa Fe, New Mexico. He is also Food+Dining Editor for Santa Fean magazine and a regular contributor to Su Casa. Brined Smoked Salmon For the brine: Âź cup kosher or other coarse salt (Randy Goldstein recommends the Salish Smoked Salt from the Artisan Salt Co.) Âź cup Sugar in the Raw 1 side of salmon, skin on, approximately 2 lbs. 8 cups cold water Dissolve the salt and sugar in the water and place the brine in an oblong, nonreactive deep pan that can accommodate the fish. Submerge the salmon, flesh side down, and allow to marinate for 30 minutes at room temperature. Remove the salmon from the brine and blot dry with paper towels. Prepare the smoker and smoke fish for 30 minutes at 185 degrees. Remove from smoker and allow to cool. Serve with a simple sauce made from mayonnaise, Dijon mustard, lime juice, capers, chopped scallions, and chopped herbs. The perfect starter: smoked salmon served with chopped herbs, savory crackers, and a creamy caper sauce. It may technically belong to Spain, but Catalonia embraces a culture all its own. Tucked into the northeast corner of the country’s Mediterranean coastline, Catalonia and its locals embrace a rich heritage. The Middle East, Italy, and neighboring France all played a role in shaping the region’s customs, language, and, of course, food. Chefs take great pride in keeping dishes simple and developing the deep flavors of the ingredients. Rice, citrus fruits, eggplant, olive oil, garlic, and plenty of fresh seafood and shellfish form the basis of this flavorful cuisine. Spaniards enjoy a good party, so it’s no surprise that their favorite dishes are meant to serve a crowd. With a few simple adjustments, these recipes form the ideal menu for a stateside fiesta. Catalan Spinach with Raisins and Pine Nuts melds sweet, savory, and salty flavors with fresh spinach and the crunch of pine nuts. Spaniards prefer to indulge in tapas, small appetizer-sized portions meant for sharing. This popular Catalan tapa translates perfectly into the American pre-dinner salad. Toss plump raisins, pine nuts, green stuffed olives, and spinach in a quality Spanish olive oil infused with toasted garlic and onion for a dish that is bursting with the flavors of Spain. onion and minced garlic until golden brown. Add the pine nuts and raisins and sauté until warm. Remove from the burner and set aside. Trim the spinach stems and rinse the leaves thoroughly. Place the wet spinach in a second large sauté pan and heat just enough to allow the moisture on the spinach to steam. Be careful not to overcook the spinach. Season with salt and pepper. Toss gently the steamed spinach with the onion, garlic, olive oil, and pine nut/raisin mixture. Garnish with slices of the pimiento-stuffed green olives. Serve with toasted flat bread. Spaniards enjoy a good party; dishes are meant to serve a crowd. Paella Mixta Paella is the dish most clearly identified with Spain. By most accounts, it originated in Valencia, the region bordering Catalonia to the south, but this flavorful concoction of rice, vegetables, and aromatic spices has blossomed into the poster child for the entire country’s cuisine. Each region incorporates their special twists, and the Catalan version naturally includes a generous amount of fresh seafood. Americanize it by mixing in pork and chicken, or give it Southwestern flair with chorizo sausage. This scrumptious adaptation includes a little something for all tastes. Visit your favorite gourmet kitchen shop to find an oven-safe paella dish, then try out Paella Mixta, a glorious concoction of seafood, vegetables, and saffron-scented rice. Preheat oven to 375 degrees with a lower shelf inserted for your paella. Rinse and scrub mussels and clams, discarding any open and dead ones. Rinse the cooked crab or lobster claws. Rinse, peel, and devein the jumbo shrimp and set all aside under refrigeration. Heat half of the olive oil in a sauté pan and brown the chicken chunks on all sides. Remove to a plate and hold warm. Using the same oil and pan, sauté the chorizo sausage. When cooked, cut into chunks and set aside with chicken. In the same oil and pan, cook the onion and garlic until lightly browned. Add the tomato and bell peppers and sauté until partially cooked. Add the chicken and chorizo back in. Cover with foil and set aside off of the heat at room temperature. In a paella pan, warm the remainder of the olive oil. Add the Bomba rice and slowly stir and sauté until rice is translucent. Turn up the burner heat and gradually add the chicken stock, saffron, and spices. Bring mixture to a rapid simmer, stirring constantly. Add the clams, mussels, lobster, escargot, and shrimp, and let simmer for 5 minutes. Mix in the chicken, chorizo, browned vegetables, capers, and peas. Gently stir all items until fully mixed. Cover the paella pan with aluminum foil and place into the preheated oven for 20 minutes. When the rice is tender and has absorbed the stock, uncover and cook the paella for another 10 minutes. Remove from the oven and stir loosely with a kitchen fork to fluff and separate. Garnish with lemon wedges. Paella Verduras Eating vegetarian is quickly growing in popularity in the United States and around the world. Traditionally, not all Spanish paella included seafood and meat. Peasant towns and those far from the plentiful seafood of the ocean often mixed up a simple and tasty concoction with lots of fresh veggies. This version incorporates a walnut pesto for a gourmet twist. Spain’s traditional dish goes meat- and seafood-free in Paella Verduras. Use your imagination when choosing veggies. Catalonian chefs take great pride in keeping dishes simple and developing the deep flavors of the ingredients. 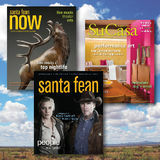 Su Casa magazine is published 4 times per year. Photographs by Bill Faulkner A recent vegan wine dinner at Opus World Bistro included this dish of grilled eggplant, pumpkin plantain puree, curry spiced cauliflower tempura, fried leeks, and tandoori-spiced tomato sauce. Vegan-friendly wines (above) were served with each course. from her son 23 years ago. “Mexican restaurants, forget about it,” she says ruefully, referring to the fact that most Mexican restaurants cook their beans in lard, a no-no for vegetarians. “You have to cook at home a lot of the time.” Still, as Sargent notes, there are many more options for vegetarians and vegans in El Paso than there were a decade ago. Local markets catering to fans of organic produce and natural foods carry items that make it easier to cook without animal products. Sargent recommends the veganprepared foods at Cielo Vista Natural Market near the Cielo Vista Mall. In addition, Sprouts on Mesa Street offers a significant selection of tofu, tempeh, and other staples of the vegetarian diet. Tofu and bulgur wheat “crab cakes” with basil corn relish, horseradish cream, and avocado sauce. Opus Chef Michael Ross makes a dairy-free dessert of apple confit with green apple sorbet and raspberry coulis. At Opus World Bistro, chef Michael Ross willingly adapts his menu for individual dietary requirements ranging from gluten intolerance to raw foodism. vegetarian dishes on the menu at Opus), he has a history of cooking meat-free dishes, stemming from his brother’s conversion to vegetarianism in 1969. Back then, Ross says, “no one knew what [vegetarianism] was.” After graduating from the Culinary Institute of America, Ross went on to work in Michelin-starred restaurants in Europe and fine-dining establishments stateside. Perhaps his best training came from serving as the executive chef for the Scheherazade Restaurant at the Trump Taj Mahal Hotel and Casino in Atlantic City. The restaurant had no set menu; instead, Ross would consult with each diner and prepare a unique dish depending on his or her particular preferences that evening. Such on-the-fly culinary invention prepared Ross for Opus, where he willingly adapts his menu for individual dietary requirements ranging from gluten intolerance to raw foodism. After the success of the VSEP dinner, Ross expanded the vegan and vegetarian options on his menu and began hosting a four-course vegan wine dinner on Thursdays. With Opus filling a much-needed niche where vegetarians can enjoy a fine-dining experience alongside their meat-eating friends, Ross has raised the bar for El Paso restaurants across the board. And for those who don’t plan on giving up their bacon anytime soon, it’s worth noting that simply increasing the proportion of vegetarian food in your diet—“meatless Mondays,” for example, or eating vegan before dinnertime, like food writer Mark Bittman—has a salutary effect on health and the environment. Thanks to foodies like Sargent and Martinez and chefs like Ross, taking that step is now easier than ever. erfect Spanish paella doesn’t happen by accident. The right ingredients are critical for true authenticity, which is best achieved when you use the same products the locals choose—those produced right in the heart of Spain. It’s practically required to round out any authentic Spanish meal with a good glass of vino. The country’s warm, dry climate makes it ideal for producing some superb varietals. Several pair beautifully with paella, such as Campo Viejo’s Tempranillo, a full-bodied red wine with fruity undertones. Grenache wines offer a hint of spiciness that stands up to this flavorful dish; Castillo de Monseran produces a particularly enjoyable bottle. Once so valuable it served as currency, the saffron bulb boasts a long and appreciative culinary history. It appeals to the senses in so many ways: The dense and enticing aroma is captivating, while the color, a vivid crimson, is visually appealing. Spanish paella, along with many other delicacies from around the globe, remains incomplete without the slightly bitter, yet subtly sweet flavor of this magnificent, ancient spice. Bypass the powdered versions in favor of the delicate saffron threads that can be steeped in a mild stock or lightly toasted and crumbled into the dish. Bomba rice Any Italian chef worth his salt knows that rice with a creamy finish, like Arborio, is a must for impeccable risotto. Likewise in Spain, not just any rice will do when conjuring up the country’s most lauded dish. The essence of successful paella lies in the ability of the rice to absorb the flavors of the broth, and Bomba rice has a reputation for being the best. Expect to pay a bit more than for the more common varietals, but with three times as much liquid and seasonings steeping into each grain, no selfrespecting Spanish chef should settle for less. If you’ve never purchased saffron before, expect some sticker shock at the checkout counter. It’s pricey but oh-so-worth the splurge; nothing compares to the complex flavor of these crimson threads.